Is it the abrasive sensation of the megalopolis Mexico City or is it more the shivering awe in the shadows of an ancient Aztec temple that keep the tunes of this Mexican Electronica craftsman confidently on the edge between beauty and bit reduction. Just envision an immaculate House tune being fragmented into a thousand shiny dazzling splinters and then being recomposed by the artist showing an unconcealed indulgence for tiny little flaws and scratches. 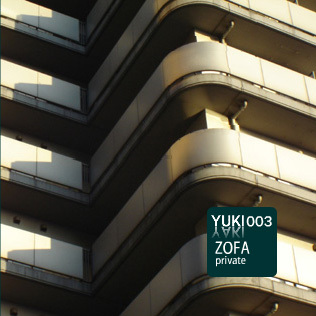 Zofa keeps a moderate pace on his 5-tracker for Yuki Yaki which appears to underline the comfy furniture reference of the name itself. Zofa seems to be more after the slightly abstract dim-lit glamour of an artisan bar than after floor-breaking excitement. This minimalist cocktail has to be served chilled! Hearing the music of Miguel Gonzales aka. Zofa you take a vast trip through minimal electronical soundscapes. For example you can discover different urban noises and samples of radio shows from the mexican home of the artist. Furthermore, he tries to support the electronical music scene of Mexico with his own initiative and creativity as he ist the founder of the label "Disco Konfort" on which mostly mexican artists are releasing. Additionally, Zofa cooperates with different kinds of artists from Mexico City and the whole mexican Country. The results of this work, very divergating in style are condensed in "Discos Pocilga". excelente disco! de lo más fino. Muchas feclicidades al krnl Miguel. minimal with soul! great stuff!!!! Zofa-The Big Aesthete! The best for today the minimalist. The big aesthete of a sound. Even the tempted music fan receives true aesthetic pleasure. A sound soft, cosy. I shall wait for new releases. Zofa-Respekt!!! saludos a los compas mexicas! I loved avi sccot, but i couldnt hear aria giovani nor jane darling, file not found was the message. viva zofa!